Investing in mobile devices is a necessary, yet serious expense for many small businesses. With work happening in and out of the office (if a traditional office even exists), entrepreneurs need devices that can be used for several tasks throughout any given day. To help find the best tools for the job, we’ll highlight the four different types available in the market today, with some examples of models that may pair best with your organization. HP ElitePad 1000 With Windows* 8.1, 64-bit Intel processor & 4G/LTE capabilities, this is a powerful tablet for those looking for top performance. Nokia Lumia 2520 Crisp display, clean design in a variety of colors, this tablet combines the easy-to-use features of a traditional tablet with the business side productivity of Windows* 8.1. For recommendations on other Windows* 8 tablets, check out this Top 10 list from PC Magazine. Acer Aspire S7-392 Solid body and a variety of features, this machine is great for general use. ASUS Zenbook UX30 Durable, light with extremely scratch resistant Corning Gorilla Glass, this Ultrabook™ is great for road warriors on staff. Dell XPS 15 Sleek and powerful, this device is perfect for those looking for top performance. HP Spectre 13 Ultrabook™ The thinnest computer HP has ever made, this machine is a great fit for anyone looking to spend a bit less without sacrificing necessary functionality. Samsung ATIV Book 9 Plus Sharp visual display and an extended battery life, this Ultrabook™ can also synch with select smartphones. 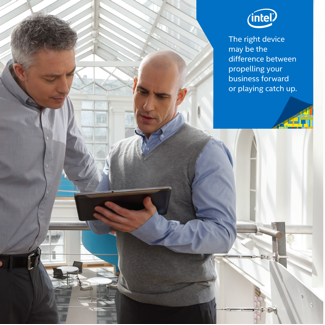 Dell Venue 11 Pro An entry-level device for anyone looking for a step-up in functionality compared to a standard tablet. Lenovo IdeaPad Yoga 2 Pro Various styles and features are available in this series of models used by professionals around the world. Microsoft Surface Pro 2 The perfect example of duality, the Surface has been the go-to device for those looking for the best components of both tablets and laptops. Sony VAIO Tap 11 Toward the higher-end of 2 in 1 devices, Sony doesn’t compromise when it comes to power, but has several options depending on need. HP ENVY TouchSmart Top-end graphics and a terabyte of storage, this is HP’s workhorse model. Toshiba Tecra Workstation Incredible fast, this Notebook is one of the best available today. Finding the right device for your small business can be a somewhat lengthy process, but narrowing the search to those devices running Windows* 8.1 can dramatically cut-down on other options that likely will not have as many business-first features most entrepreneurs will consider essential. For additional material on finding the best mobile devices for small business check out Best Mobile Devices for Small Business.